A Russian academic, Dmitri Mendeleev, had more than a passing interest in the basic elements of the universe; those elements which combine to make up physical matter. He struggled to understand the seemingly random properties of these building blocks, until one day while on holiday he took a nap. He dreamed a 'vision' of the basic elements of the universe flowing together in an orderly fashion. As soon as he woke he noted down every element in order. This story may be the truth or a version of the truth, nevertheless Mendeleev is accredited for producing the order which has become known as the Periodic Table of Elements. Now we’re about to blind you with some science. Okay, that's a complete lie. There's no science at all in our dreams periodic table, just lots of dream topics for you to ponder, peruse and contemplate. Let our periodic table of dreams serve as a guide into the depths of the world of dream interpretation. What do specific dreams mean? Does dreaming of money mean you'll become wealthy? All of these questions may be answered with our table! 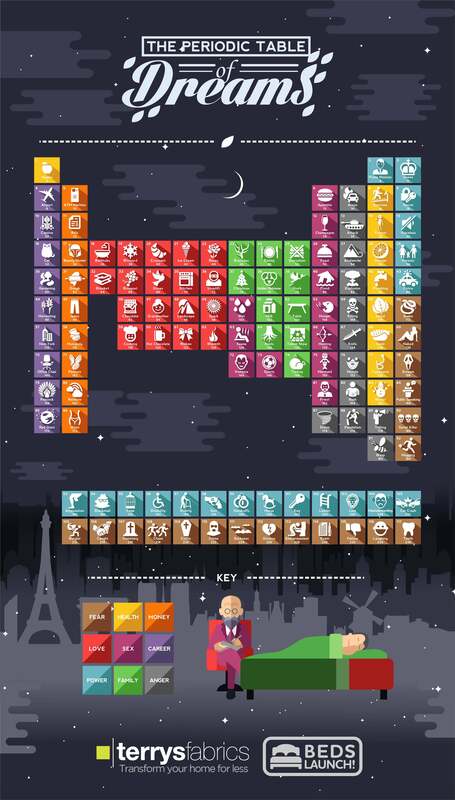 Take a look and browse through our periodic dreams table you never know what you may discover! Some things are sure – when you buy one of our fabulous beds your dream of having a peaceful and restful sleep may just come true; the savings you'll make are dreams turned into reality!